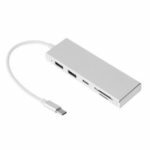 This 5 in 1 Type-C To USB 3.0 Hub, including 2 USB 3.0 ports, 1 Type-C port, 1 SD memory card reader and 1 MicroSD memory card reader, be able to connect keyboard, mouse, thumb drive, phone & access files from card reader slots. Instant expansion, plug and play with super speed @5Gbps (USB 3.1 Gen1). 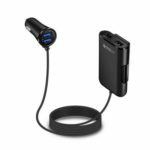 Incredibly compact and small size, portable and easy to carry. Easily slide it into your pocket, bag or suitcase. 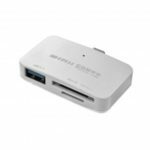 Instant expansion, plug and play with super speed @5Gbps (USB 3.1 Gen1); 2 x USB 3.0 ports, 1 x SD memory card reader & 1 x MicroSD memory card reader, be able to connect keyboard, mouse, thumb drive, phone & access files from card reader slots. Incredibly compact and small size, portable and easy to carry. Easily slide it into your pocket, bag or suitcase. 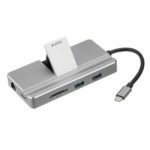 5-In-1 Hub & card reader, up to a 5Gbps transmission rate, compatible with USB 3.0, USB 2.0 and USB 1.0. 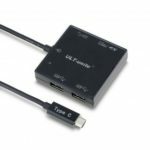 Type-C female port can only transmit data, can not be charged. 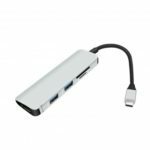 Compatible USB-C devices(including but not limited to the following), MacBook (12-inch), MacBook Pro (13-inch & 15-inch), Google Chromebook Pixel (12.85-inch), Dell XPS 13 9350 (13-inch) / XPS 15 9550 (15-inch), Huawei MateBook (12-inch), or other Laptop PC Android phone with Type C port and OTG function.